Janet and Tony, she originally of Reading in Berkshire and his family from Northamptonshire, made themselves our hosts in Gagetown and environs (we even spent a wonderful evening rafted up behind Ox Island, near Oromocto). We are inspired by their creativity, craft, warmth, and energy. Janet took this picture of Peregrinus from the deck of the Thomas Gage and sent it to us recently. Peregrinus in the mooring field at Gagetown Creek, Saint John river. Photo by Janet Ratliffe from the Thomas Gage as it departed on yet another exploration of the river, 10:25 AM 4 September 2014. Canon PowerShot SX240HS, ISO 100, 1/1250". People everywhere have come by and said hello or have come to the end of their docks and waved us down for nice chats. Garry came out, gave us anchoring advice, and sent us this picture. Peregrinus safely anchored in Halcyon Cove, inside Cumberland Bay, Grand Lake. The Zodiac hangs from Peregrinus' stern and Garry's Happenstance lies on a mooring deeper inside the cove. BlackBerry 9900, 7 September 2014. A wonderful aspect of sailing the Saint John is that you get to see the countryside go by from up close. And the countryside gets to see you, too. 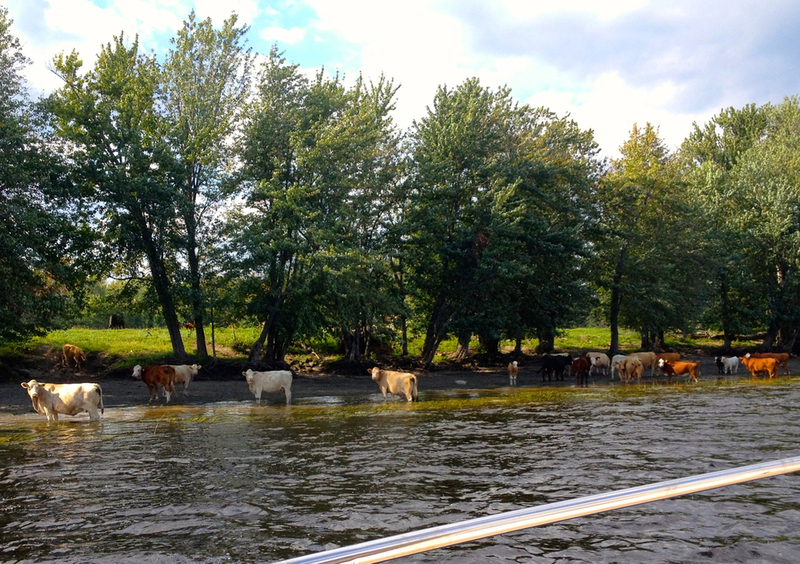 We came across many cows, who regarded with some concern this big white thing, as it floated by. there's likewise a wind on the heath. Life is very sweet, brother; who would wish to die? Click on the photo for clarity. Simultaneous panorama picture of sunset and moonrise (a bit over 180° field of view), from Peregrinus aft deck; the slanting lines are the boat's backstays. 8:17 PM, 8 September 2014, Mouth of the Salmon river, Grand Lake. iPhone 4S, ISO 640, 1/120", original 9365 pixels wide. Purple moonrise in the Northeast Arm, Grand Lake, Saint John River. 7:56PM, 8 September 2014, iPhone 4S, 1/24." Peregrinus reached the north end of Grand Lake at the mouth of the Salmon River: N 46°4' and W 65°55'. The Salmon is sufficiently deep for Peregrinus to sail all the way to Chipman, but power lines halfway there that are only 16 meters high are an unsurmountable obstacle in the river; we instead went there by Zodiac and reached latitude N 46°10'. This is higher than Montréal and Halifax, which sounds impressive enough, until one realises we are only as high as Lake Como in Italy, and that London, Copenhague and Helsinki are much, much further up north. Maybe next year! 7 September 2014: Peregrinus on a port tack approaching Newcastle, three-and-half miles west of the mouth of the Salmon. The black dot to the left of the boat icon is Fredericton, and the dot below it is Saint John. The water on the right half of the map is the Gulf of Saint Lawrence, whose north shore we explored last year. Founded in 1758, the town takes its name from Col. Thomas Gage, the original grantee. Gage fought alongside George Washington at the Battle of the Monongahela, where a column of 1300 British (including Virginia Regiment locals) were routed by 100 French Marines, 150 New France militia, and 650 Indians. The Brits ended up with 900 casualties including their commander, General Braddock, whereas the French and Indians lost 90. Gage took field leadership of the Englishmen and Washington of the Virginians after the death of Braddock and organised the retreat, such as it was. Gage later held the posts of Governor of Montreal (immediately after the British took over New France for good in 1760) and Commander-In-Chief, North America 1763-1773, and 1774-1775. He was married to a Colonial, a grand-daughter of Stephanus Van Cortland. The people of Gagetown we've met are without exception very friendly and very proud of their legacy. Among the many we have met, Tony (a Brit transplant) gave us navigational recommendations and a tour of his bucket trawler, the Thomas Gage; Wilf and Christina were excellent hosts at their family farm; and Brenda at the Gagetown Cider Company introduced us to her family's original ciders, bubblys and wines, available only on site and in Moncton. Brenda's dog decided to walk us from the Gagetown Cider Company's warehouse to our Zodiac, which we had left at Fox's Wharf, right at the entrance of the orchards. Remarkably, he waited at the wharf until we tied off, then immediately he got up and went home. When the English partitioned their Nova Scotia territory into three separate colonies in 1784, they named the westernmost, non-peninsunlar section, New Brunswick, in honor of King George III's possessions in Germany, as, in addition to being the mad king of England, he was Prince Elector to the Holy Roman Empire, on account of concurrently being the Duke (Herzog) of Braunschweig-Lüneburg. In English, as well as in Spanish, French, and other mainstream tongues, Braunschweig is rendered as "Brunswick". It is amusing to consider that the King could in the 18th century get away with being a Prince Elector, whereas Thomas Arundell, the father of the Anne Arundel of Annapolis, Maryland, was jailed and could easily have lost his head for merely accepting a Countship from the Roman Empire just a bit over a century before the kings of Britain became Germans themselves. That's the divine right of kings for you. We arrived in North Head Wharf, Grand Manan Island, on 4 August 2014. Peregrinus is on this photo, center, behind the wharf. A phone call to the Canadian Border Services Agency that same afternoon and voila!, we were checked into Canada. Were that all countries worked like so.